Our customers and their partners continually tell us that they want more leads. I haven’t met a sales or marketing person that doesn’t want more leads to ultimately close more deals. Because of this constant demand for more leads, most channel marketing and sales professionals believe that their efforts should start with demand generation. However, I question whether demand generation is really your best starting point. Is Pushing Leads Straight into the Funnel Really a Great Idea? Remember our recent post about Putting an End to Leaky Pipe Syndrome? Pushing a bunch of leads into the funnel may seem like a great idea. However, without a supporting framework and key elements like nurturing campaigns and established marketing and sales qualification strategies, the vast majority of your leads will never convert to sales. 1. Marketing & Sales Qualification: Start by defining tele-qualification roles and providing scripts to improve the effectiveness of outreach efforts. 2. Online Presence Enhancement: Use syndicated content to improve your partners’ online presence while ensuring brand consistency and strengthening data and insight about site visitors with analytics. Not providing this means you run the risk of your partners being disqualified early on in the sales process. Social media syndication can also enhance your partners’ social media efforts and expand your reach. 3. Lead Distribution with Closed Loop Analytics: Your marketing efforts are already generating leads that you share with your partners. Now you can automate lead distribution to deliver them faster, with much less hassle, and increase visibility into what is actually happening to the leads you pass on to partners. Conversely, gaining your partners’ confidence in sharing leads and opportunities with you opens the door to capturing pipeline on their generated leads. 4. 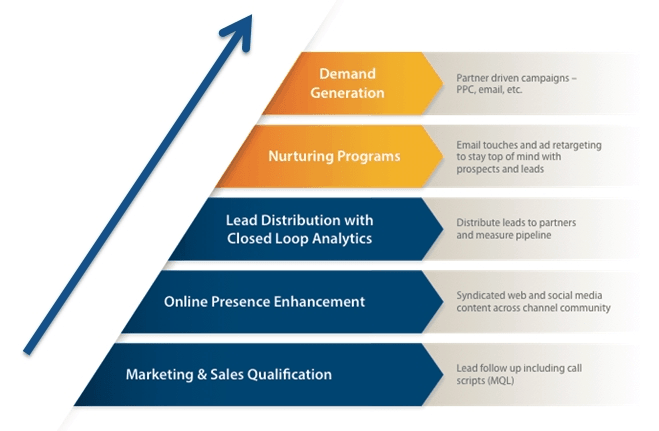 Nurturing Programs: Direct partner efforts for leads that are not ready to buy with both content and technology to help them nurture leads and stay top of mind across the life of a sale. Keep in mind that, according to Forrester Research, companies that excel at lead nurturing generate 50% more sales ready leads at 33% lower cost. 5. Demand Generation: Offer demand generation elements such as Pay-Per-Click (PPC) online advertising and email marketing to drive additional leads for partners. But, keep the best practices outlined here in mind and don’t kick off demand gen until tele-qualification, web presence and nurturing efforts have been put into place. The next time your team screams about wanting more leads, think about whether you have established the proper foundation to drive sales. Then consider which pieces are missing to ensure your partner efforts and marketing investments will have the most success. I love this – too many folks want leads with no thought on how to get there. Just think about the second level of the “pyramid” – if you get outreach and visit a website that stinks – what would you do? This formula works for long term success! Totally agree with this approach. No doubt you need a solid foundation before you can build a well constructed house. But, the economics of doing this require money at some point. While the foundation needs to be built and well established early on, the organizations that seem show the greatest success the earliest seem to put a foundation in place while working to get a few opportunities in the door to help close some deals faster. I’m not convinced that you can do one without the other. Mike, you make a very good point and it is one we often run into when helping organizations develop their strategy. The way I most often hear it is, “I need to generate leads for my partners” or “my partners want more leads” or “I need to show leads to validate the program.” So it is a balancing act, for sure. Yet, when demand gen (lead gen) is an early focus of a channel marketing program what invariably happens is early excitement (engagement) from the partners which is later replaced with apathy over the high volume of unqualified leads that resulted in very few new opportunities. Once partners have apathy towards a program, it’s hard to regain engagement. Tele-qualification, content syndication, social media syndication and even email nurturing are tactics that prove effective over the long haul and come with lower expectations being set of returns in the immediate future. There is little investment required by the partner to get these programs started and to maintain them and the partners approach them with a more strategic mindset. When demand generation tactics are added later (which are also more expensive) the partners have the marketing machine in place to support effective nurturing and qualification of their leads. The partner sales reps also remain engaged because they only work with the qualified leads at the end of the funnel.